I made this tutorial because I was able accomplish what just about every off-road rider has wished for... and that was to get awesome lighting on my motorcycle for a cheap price. Stock lighting was what you had to live with unless you wanted to spend mega dollars on stators, lighting coils, plus the light itself and mounting hardware. We used to try to hurry back to the truck as soon as it got dark because it was difficult to see all the obstacles on the trail. We plan night rides now. These are literally blinding. It's changed everything about riding at night. They are smaller than anything available (at the time this was created) and just as bright if not brighter than the lights that are being sold for hundreds of dollars. They can be mounted anywhere with some creative engineering (zip ties and velcro). This tutorial shows you how I built mine. Feel free to make yours better. I'm sure there are better and more effective ways. I put everything I could think of in this tutorial to allow you to build your own. You won’t be disappointed!!! 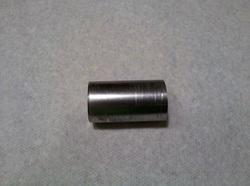 I started out with an aluminum flash light that I bought at Home Depot for $2.88. 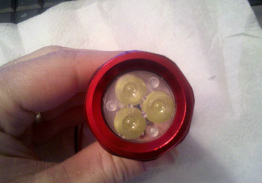 Make sure the end of the flashlight where the LED will go is at least 21mm inside diameter to allow for the new LED. This one was just over an inch (id) and will work great. 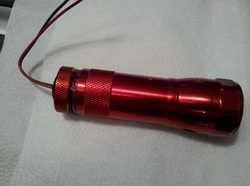 Step 2 - Disassemble the flash light and remove all the internal parts. I had to use a socket and hammer to tap the existing LED and lens. 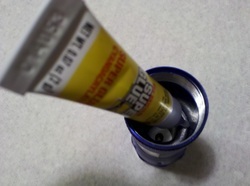 Try using a small flat screw driver from the inside to pry it out. I ended up shattering the lens and had to cut one out of goggle lens. I took a pair of old Renthals that were bent from a previous mishap and cut about 1 ¼ inches off the end. 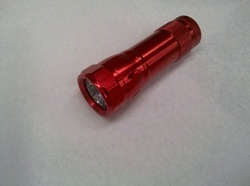 1) It secures the LED inside the flashlight housing. 2) The most important reason is to act as a heat sink. These baby’s get warm. Without proper heat transfer the life of the LED is dramatically lowered. 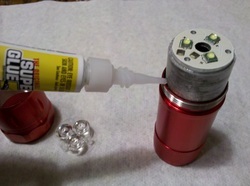 The flashlight housing acts as a heat sink as well. JBweld the led circuit board to the head sink. 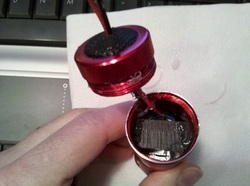 A thermal epoxy is even better but very expensive. Make sure the surface of the heat sink is as flat as possible. 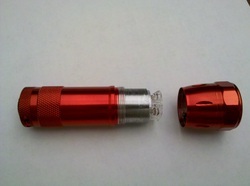 Place the heat sink in the housing of the flash light with the optics in place and screw the clear lens that came in the flashlight along with the end cap onto the housing. This way when we glue the heat sink in (step 6) gravity will be holding everything together perfect enough to hold it together while it dries. 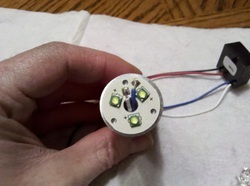 Turn the flash light so the lens are face down and put a small amount of super glue or epoxy between the heat sink and the flashlight housing. Let it dry for a few minutes. Remove the end piece, lens, and optics and add more super glue or epoxy to the heat sink and the flashlight housing anywhere you can to ensure it won’t come loose. Take the 1000ma Buck Puck driver and find the white(+) and blue(-) wires. 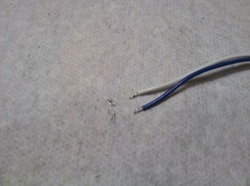 Clip off about half of the exposed leads and apply a small amout of solder to the exposed wires. 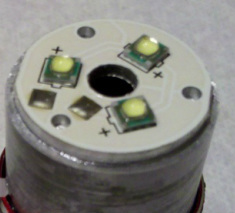 The reason for cutting half off is because the area on the LED circuit board you’ll solder is extreamly small. Run the white(+) and blue(-) wires from the bottom of the flash light housing up to the led and carefully solder the wires to the board. It took two of us, one to hold the wire and one to heat the pre-soldered wire and the contact on the board. 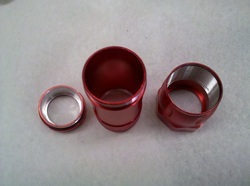 If the flash light you found is the right size you can hide the Buck Puck Driver in the housing. I had to grind some of the edges to get mine to fit. Apply some silicone to keep it from bouncing around. Oh, if you have any ideas on mounting these lights email us some pictures and we'll post them here.